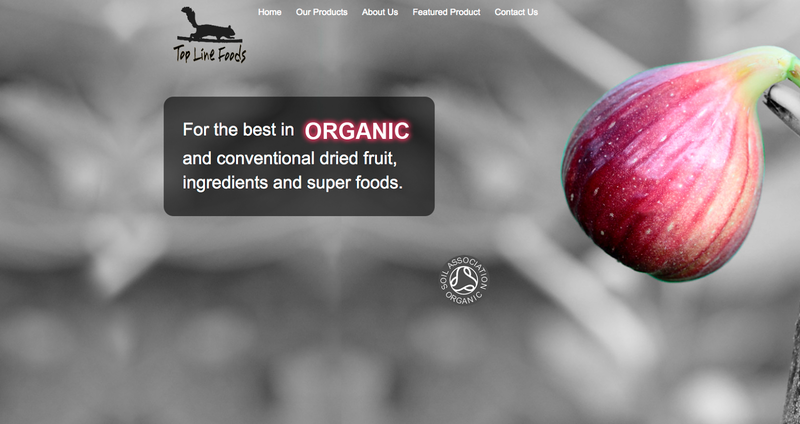 This week's website of the week goes to Top Line Foods. It's artistic in both layout and design with many endearing features that make it a pleasure to read and explore. This website was built to give our client, Top Line Foods, the platform they needed to compete with their competitors. But more than that, something that would stand out as something extra-special. Top Line Foods are food importers and exporters who put the utmost effort and care into the quality of their service as well as the quality of their products. They specialise in foods such as high quality Cacao and other fruits and nuts. Some recognizable: dried blueberries, Brazil nuts, figs, pine-nuts as well as other, more exotic foots like: acai powder, aronia berries, coconut blossom sugar and quinoa grains. The first thing about this website you are bound to notice are the bold, responsive background images that resize automatically to screen size with no scrolling. They were created to have that dreamy, out of focus black and white effect with a vivid splash of colour in the forefront. This effect was dreamed up by the client and brought to life by our Design Team. If you ever have a look in mind for your own website, we will always strive to achieve it for you until it's exactly as you imagined. The content itself is simple but well laid out over 5 pages. This really sells the product giving it an overall very professional look. The eye is led down the page with arrows and beautiful images alongside passages of descriptive text. Finally, the very last feature to mention and the most quirky by far is the Hidden Squirrel. She wanted to run a competition to bring enquiries to her website and so asked us to place a moving squirrel somewhere on one of the pages for visitors to find. The competition has since closed, but the squirrel can still be found on the contact confirmation page. The client was very happy with her website, stating that she was "happy with our service and the patience and knowledge of the team was great," giving us 4.5 stars. Have a browse through the website for yourself and explore first hand this wonderful website envisioned by Top Line Foods. Yet another website that we are very proud to deliver for a very deserving company.